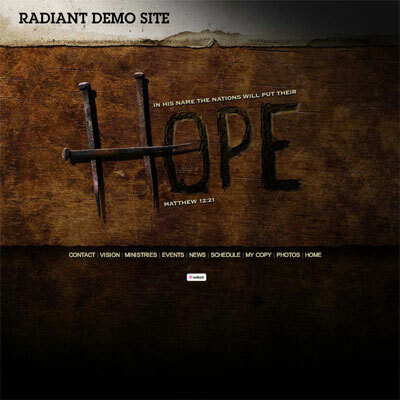 Piggybacking on our desktop wallpaper release from yesterday, we are pleased to announce a new Radiant WebTools template entitled "Hope". Just like the desktop wallpaper, the 'Hope" website template is inspired by Matthew 12:21, "In His name the nations will put their hope." As usual, all Radiant WebTools 3.0 templates are fully customizable including the ability to change the number of columns, colors, fonts, etc. If you would like to use a simplified version of your home page, edit your template, click the Layout Tab and choose "Hide All Columns (Simplified Home Page)". Resource files for the new template can be found in the "Download Materials" menu under "Template Resource Files". To change your template at any time, login to your Radiant WebTools account and select "Choose My Template". Note: If you would like to have Radiant customize a template specifically for your ministry, please contact us. We can also assist you with your branding, marketing and communications strategy. View a sample in our portfolio.